Synopsis: Two journalists travel with their friend abroad to find his sister who is now part of a "clean living" commune. Director Ti West has always been known as a guy with one foot in the past. His debut film, THE HOUSE OF THE DEVIL, felt like it was plucked from the 1980's video rental place. Even his follow-up, THE INNKEEPERS, had that old school haunted house vibe. 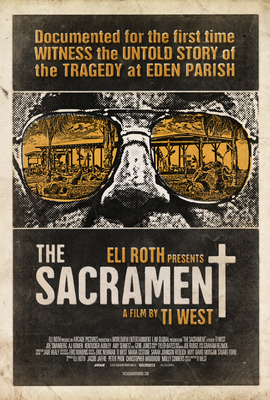 Very refreshingly, THE SACRAMENT is very much a modern movie that uses a modern style, found footage. West has created what is his best movie to date, and one of the best entries into this sub genre/style. And seriously, don't be fooled by the "Produced by Eli Roth" tag. It is not indicative of the quality of the movie whatsoever. The movie follows reporters, Patrick, Jake, and Sam, from Brooklyn based publication VICE when they venture out to an unknown location looking for Patrick's sister who recently joined a "clean living" commune. Of course, when this commune picks up and leaves the country, this raises some very deserved flags, so being the cutting edge reporters that they're are, they decide to get a camera man and go investigate. It turns out that the move out of the United States was part of Father's plan to create a safe space for the Eden Parish to flourish on Earth. We, as the audience, know that this totally a cult, but it's actually really fun to see the characters discover this. To answer a very important "found footage" question; no, the camera's placement doesn't always make sense. There instances when you don't understand why they would be holding the camera during some rather perilous situations. Thankfully, the movie earns its suspension of disbelief with a solid story and acting. The five main characters in the movie all do great job, adding empathy to the characters thus raising the stakes. Per the Q&A, West said that he wrote all of the parts specifically for these friend of his. And while everyone gives solid performances, A.J. Bowen and Gene Jones, as the mysterious Father the cult leader, were the stand out performances. They have one of the most tense scenes in recent memory when they sit down to do an interview, and Father's charisma and swagger just dominate the conversation and switch the roles of interviewer and interviewee. 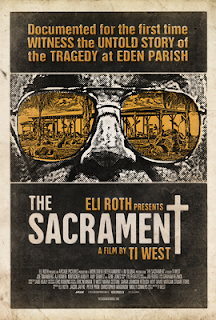 What would make THE SACRAMENT West's best movie is the ever-present sense of dread and tension that permeates throughout the movie the minute that Patrick, Sam, and Jake arrive at the Parish. Having just seen THE FAKE, a movie that is more outwardly spiteful towards religion and faith, it was interesting to see just how even handed the movie seemed to be on the subject. The writing is particularly strong in how they flesh out the members of the cult in a way that doesn't make them seem like lunatics or idiots. If it's not a poor neighborhood, its an addiction problem, or the inability to deal with grief. With their stories being relatable, it's easy to imagine, someone you know falling prey to this. Without getting too heavily into spoiler territory, I wanted to make note of the fact that this movie has one of the most painful and tragic death scenes since that one from SAVING PRIVATE RYAN. THE SACRAMENT takes the now-tired conceit of found footage and manages to make a very violent and downright terrifying movie about a cult. This is also his most thematically dense movie yet, one that explores peer pressure as it pertains to the manipulative side of religion and how desperate people will be in order to find happiness.